This page collects information about nutritional facts and other properties of almonds nuts in summary. The information on this and other food has been gathered from various sources and may not be totally accurate. Among the data shown in this website you can find information about proteins, vitamins and minerals from almonds nuts and other nutrients like fiber, calories or cholesterol. The proportions of nutrients in almonds nuts may vary depending on the type and quantity of food, and other factors that might contribute to the modification of its nutrients. Remember that depending on the preparation, almonds nuts may vary their properties and nutritional characteristics. You can use this information to understand your dietary intake of this food or any other nut and seed products. This can help you to cook better and healthier recipes including almonds nuts, but remember to consult your doctor or nutritionist before beginning any regimen or make drastic changes in your diet. 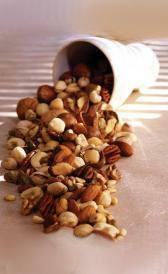 In your regular grocery store in the group of nuts you can find almonds nuts among other available foods. Below you can see information about nutritional facts, properties and benefits of almonds nuts for your body as well as the amount of each of its major nutrients. Eating almonds nuts will give you extra energy to get through the day, whether it be at work or to get to the gym. If you want more energy, almonds nuts can help you on this since almonds nuts is a high energy food. This food is abundant in protein. Benefits of eating rich protein foods like almonds nuts are well known nowdays. For example, protein in almonds nuts provides the groundwork for healthy muscles, blood, cartilage and skin. Eating almonds nuts is not recommended in weight loss diets as this is a food high in lipids. High fiber foods like almonds nuts may reduce your risk of cardiovascular disease, diabetes and obesity. Eating high fiber foods like almonds nuts normalizes bowel movements and helps maintain bowel integrity and health. Because of its fibers, almonds nuts is useful for controlling blood sugar levels and it lowers blood cholesterol levels. Almond - Amygdalus communis a deciduous tree was an original native of the Mediterranean climate of the Middle East and right up to the Indus. From there it spread to Southern Europe and North Africa. Transported to other parts of the World not so long ago, it is widely grown in California, USA. Almond trees produce an economic crop in their third year. They reach optimum levels in the fifth / sixth year. The fruit of the almond tree is a drupe which describes almonds as a hard shell with a seed inside. Almonds are generally sold as shelled, unshelled or blanched. The inside edible seed is commonly called a nut. When, the seed coat of shelled almonds is removed by treating them with hot water – the white embryo is known as Blanched almonds. A fruit of wild almonds contains glycoside amygdalin, which after crushing becomes deadly hydrogen cyanide, also known as prussic acid. Fortunately, with domestication these deadly bitter varieties were eliminated, well before grafting became known, even though the plant does not propagate from cuttings. More than half of the worlds almond production comes from California. USA is the largest exporter of shelled almonds. To maintain these orchards, managed pollination involving a million hives being moved to the almond groves, is required. Researchers have developed self pollinating almond trees to mitigate the impact of removal of bee hives from other parts of the country and to reduce soaring costs of hives. Also, great in promoting health with monounsaturated fatty acids and many other nutrients associated with LDL cholesterol lowering ingredients. In particular, raw almonds have greater concentration of calcium, iron, manganese, potassium, fiber and vitamin E. However, USDA has ruled that, raw almonds must be steam pasteurized or worse, chemically treated with propylene oxide - PPO. Costs involved, make PPO treatment most prevalent and the known medical risks far outweigh any gains, besides the unnecessary loss of nutrient properties. As such, this requirement is being challenged in court. Ironically, imported almonds are not required to be pasteurized. High on carbohydrates, almonds can be can be made into flour for cakes and low-carbohydrate diet cookies. Its dietary fiber content adds further value. A rich source of vitamin E plus high percentage of high quality protein, one third of which is amino acids makes them ideal as daily protein supplements. Improved complexion and lower risk of cancer and elevating blood levels. Almond Oil is good as an emollient used by massage therapists The ployphenols contained in their skins, may cause allergy. Almonds are eaten in many forms: raw or roasted, almond flour, butter, milk and almond oil. The French celebrate them in Marzipans. Mexicans love almond liquor Chinese as a sweetened milk desert, served hot. Greek as wedding sweets and a soft drink. Iranians eat them as a delicacy when dipped in sea salt. Sweet almonds and roasted nuts for special occasions. Italians as deserts in cookies and as almond milk. Moroccans use almond paste as fillings for desserts. Indians use almonds in curries and as flakes in many sweets. Below is a summary table of key nutrients of almonds nuts and a list of links to tables showing details of nutritional facts of almonds nuts. They include the main nutrients as well as the proportion of each.